Trade Talk, What’s Cam Newton Worth? I got asked by a follower this week about trading away Cam Newton. Which for a lot of owners is something they need to ponder. It’s not worth having two stud fantasy quarterbacks on one team and many owners drafted Newton late as a backup. Good for you! I for one did not believe Newton would amount to much in his first year, boy was I wrong. The follower, we’ll call him Jim, has a good fantasy QB currently in Tom Brady. And with Brady just going on bye in week 7, he’s got no use for Newton anymore. Jim asked if trading Newton for MJD or Gore was a good idea. His running backs were Hightower, Bradshaw, Mo Morris and Bernard Scott. MJD and Gore would both help his team significantly. I told him that I would trade for either player Gore being first. He got back to me and said the owner of Gore accepted the trade. Probably helping both teams upgrade. Now with Bradshaw and Gore, Jim has a really nice starting lineup at the RB position. 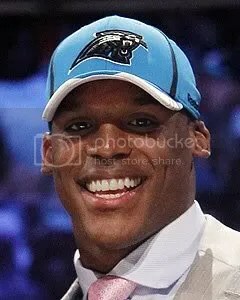 Cam is probably one of, if not the most, traded player of the 2011 season. In one league (PPR) I’m in, he was just traded straight up for Andre Johnson. That is huge, people are getting first round talent for Newton. I guess he’s worth it though, especially if you drafted the likes of Matt Ryan, Josh Freeman, Jay Cutler or Rivers. I’m just curious, what have other owners been able to get for Newton in your league? Lucotti, who did you get in return for Brady? And what week did you make the trade? Very bold decision if it was earlier in the year! Traded lloyd and mcgahee before the Tebow era in week 5 for Cam.